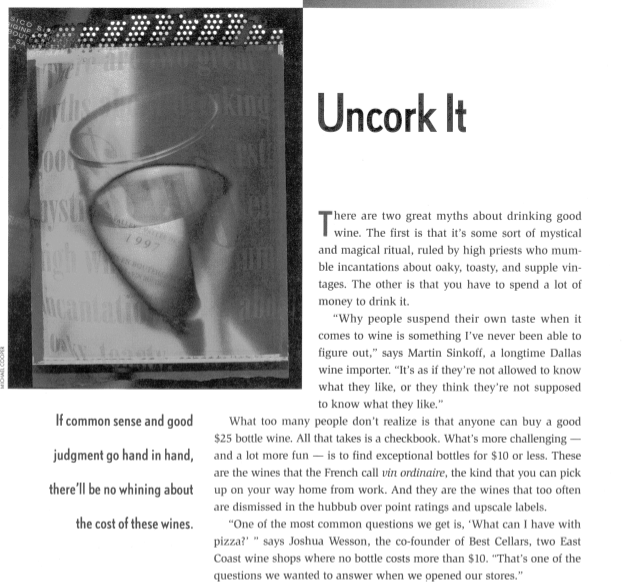 The PDF at this link is a story called “Uncork It” that I wrote for the Southwest Spirit inflight magazine in 1999. It was the first appearance of what, today, is the $10 Hall of Fame. How long ago was that? Randall Grahm still owned Big House wines; I used the word checkbook, because we wrote checks in the 20th century; and I quoted Peter Granoff of a company called Virtual Vineyard, a predecessor to Wine.com that disappeared when the tech bubble burst. No surprise to see Bogle on the list, of course, though I haven’t seen the McGuigan in a store in years, and the Belvedere no longer exists. And how far ahead of my time was I with a regional wine and moscato? As for the the Hogue fume and Jaja red blend: “Let us not burden our remembrances with a heaviness that’s gone but distant memories,” wrote Shakespeare, because those were two of the finest cheap wines ever. Versions are still around, but they’re made by different companies and bear little resemblance to what they were. In fact, they gave me the idea for this story because I got tired of hearing people tell me you couldn’t buy great wine for $10 when you could buy Hogue and Jaja. The advice? As current as ever, and it’s nice to be able to give credit to the people who first told me those things. And my editors at the time, Tracy Staton and Lori Stacy, deserve several waves o’ the Curmudgeon’s fedora. If they hadn’t bought this story, who knows what I’d be doing now? And is anyone surprised to see I was cranky about scores even then?